Until last year, the name Virunga remained in the shadow implying 'nothing more' than Africa's oldest national park, a declared UNESCO World Heritage Site and the most biodiverse zone, not only in the Democratic Republic of Congo (DRC), but in the whole African continent. A few years back, Virunga, home to the world-famous Mountain Gorillas, started witnessing events that would eventually draw international media attention. In 2007, the Congolese government decided to grant concessions (which cover around 85 percent of the parks surface) for oil exploration, despite the park's World Heritage status, to French multinational Total and to the British owned company, Soco International. Not long after, Total declared it wouldn't pursue its initial idea of exploring within the parks boundaries, although Soco's decision remained untouched. Soco stated that 'Block V', the area given for oil exploration, posed no direct threat for the emblematic Mountain Gorillas as these where located in the upper mountains. Even so, 'Block V' is known to cover what is considered to be the most biodiverse area in the whole park, home to dozens of endangered species. In 2014, Soco International's actions were put out of the shade by an international acclaimed documentary-film. Nominated to an Academy Award and considered Netflix's documentary gem, this project was first-started by filmmaker Orlando von Einsiedel, later supported by executive producer Leonardo DiCaprio and completed with the vital collaboration from independent journalist, Mélanie Gouby. Mélanie Gouby discusses her professional involvement with the Virunga project as well as her emotional attachment to the region she got to know so well. 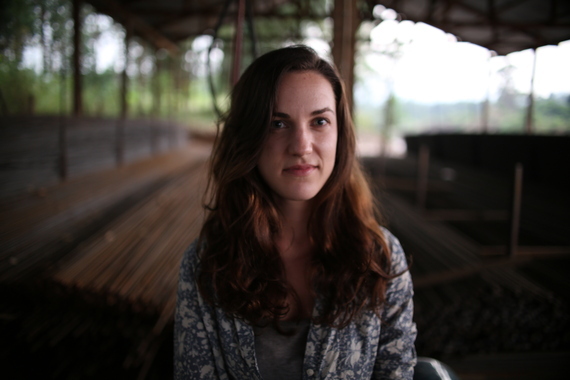 Before participating in a multiple award nominee movie, how did your personal story with 'Virunga' begin? I arrived in Goma, Democratic Republic of Congo (DRC) in 2011 where I was initially working at the 'Institute for War and Peace Reporting', heading a newsroom with 20 congolese female journalists. I did that for about a year. When you arrive in North Kivu (the eastern province where Virunga is located), you immediately notice that the park is a huge institution, not only because it covers so much of the province's surface but because the mountain gorillas that inhabit the park are one of the greatest symbols of eastern DRC. A bit like what the Eiffel Tower is to Paris. Not long after I arrived, I reported on how tourism was slowly coming back to Virunga. I fell in love with the place the first time I went there. I also managed to interview Emmanuel de Merode, the park director. I found his ideas for the region's future development particularly interesting. Around the same time, I learnt about Soco International, a British company who despite the park's 'World Heritage Site' status, was exploring for oil. Obviously, the first time I heard about it, I was pretty shocked. Not only Soco's intentions were illegal under international and Congolese law, but it was threatening one of the most beautiful and biodiverse places on earth. This is when I decided to write a story about it, but I didn't want to just write a new article and then move on. I wanted to do something that would have a bigger impact and raise awareness about the threats that Virunga is facing. Fortunately, not long after that, in April 2012, I was introduced to people working on Block V with Soco International. Already during our initial conversations, they told me pretty astonishing things about the way they were operating. I also met, by pure coincidence, the film director Orlando von Einsiedel. At the time, he had just started filming the movie so it was obvious that we had to find a way to help each other and team up. That's how the collaboration for Virunga started. What do local people think about the conservation of Virunga National Park? There is not one single opinion among the population living around the park. If I had to generalise, which I don't really like doing, I would say that they have other more pressing issues to worry about on a daily-basis. Understanding the value of conservation and its benefits depends on the geographic and social position of the people located around the park. For example, fishermen living on the shores of Lake Edward realise that working with conservation rules allow them to actually have sustainable fishing, contrary to those fishing against the park's rules, who are depleting the lake of its fish reserves. In the long-term, preserving natural resources is more beneficial for everyone. But a lot of people just think about how they can find the means to feed their families in the short-term, not in the long-term. You can't blame them for that. The migration following the Rwandan genocide has created a huge demographic pressure on the park. The population around is not exactly living under the best conditions, so that is a huge obstacle that Virunga has to overcome. Specifically on the oil subject however, everyone I've talked to know that the oil industry will not benefit them. This is a region that has been exploited for its mineral wealth since decades so they know that it will be no different with a new foreign multinational. Mineral wealth has either left the country or remained in the hands of a few privileged people. After all this experience, what meaning does Virunga have for you nowadays? This might shock you, but if oil was really going to benefit local people directly, improve their living conditions and allow the region to develop, then I would support oil exploitation in Virunga. After living in eastern Congo for 3 years, I obviously became very attached to my friends there and to the people whom I met. I have no greater desire than seeing their living conditions improve. They deserve so much better than what they have today. But the reality is that oil will never do that. On the contrary, it risks destroying everything that has been built, and create more conflict. On the other hand, Virunga does have the potential to improve the whole region's economy. It's not just about preserving Congo's natural heritage, if the park goes, you are also destroying hope for a better future. For example, just recently, the park built an eco-friendly hydropower plant on its outskirts that is bringing electricity to thousands of people, and has attracted businesses, who in turns have created jobs and opportunities for the local population. This is real, grassroots development, and that is what eastern Congo needs more than anything. 'Block V' was given to Soco International and to the Congolaise d'Hydrocarbures a few years ago, even if part of this concession included a zone of the park under the UNESCO World Heritage status. What was the UNESCO's reaction to this resolution? Well, the UNESCO was clearly against oil exploration inside the park. It has always been opposed to it. They have tried to convince Congolese authorities to revoke the oil concessions inside Virunga. Given this, how much influence and power do you really think UNESCO has when it faces similar situations worldwide? What was the hardest part of this experience for you? The isolation was the most difficult. During the investigation, I couldn't talk about anything with anyone. Only my parents and my best friend in Goma knew. So you lead a sort of parallel life, and although that's exciting at the beginning, it very quickly becomes a burden. After its global success, what impact did the movie truly have on Virunga's situation? Donations to the park have dramatically increased, tourists are coming back, there is a lot of positive energy around the park at the moment. I was there just a few weeks ago, and everyone was really optimistic. There are new borns in several gorilla families. The UNESCO screened the documentary in Paris just a few days ago and I am told that it was a success. Overall, we achieved what we had set out to do: creating global awareness about Virunga. Last year, Soco International finished a seismic study, the last phase of exploration before drilling. It will hand over the results of the study to the Congolese government in the next few months, probably in June this year. Depending on the results, the government could decide to seek a boundaries change with the UNESCO. So the decisions relating to the future of the park are now in the hands of the Congolese authorities. Many around the world have joined the 'Virunga' cause, including famous naturalist David Attenborough who last November announced to The Independent: "It would be extremely worrying if the great, rich and varied park of Virunga were to be exploited for oil. Not only would it threaten a park that is home to a vast range of wildlife including about a third of the world's endangered mountain gorillas, but it would also send a worrying signal for the future of other world heritage sites. If the treasured Virunga park cannot be protected from drilling, can anywhere else?"